Currently, you can head on over here, type “E.L.F. 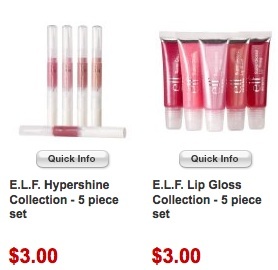 Lip Gloss Collection” in the search box and score two lip gloss 5 piece sets for just $2.70 each shipped. Just add one or both to your cart and use coupon code ER5PVIIO to get 10% off bringing your cost for each set to just $2.70 + shipping is FREE! !